Low Man On The Totem Pole is an extensive series of advice on how to make a joyful and fulfilling career regardless of what it is. Anyone with a job. Entrepreneurs and would-be business people can also take a stab at it. More importantly, anyone with no idea of what to do next might find a worthy tip on how to get started. For those with a nemesis at work, making your life miserable, this book might be what you need to live above such whirlwind. Low Man on the Totem Pole is practical and somewhat autobiographical. The author did nothing to hide her shortcomings and the knock-downs that pointed her in the right direction. The book is not just for white-collared careerists. A restaurant waiter or a manual labourer can pick it up and still find a lot to use - it is that down-to-earth. Also, the book eschews the culture of looking after the "number one" and sucking up to the boss. It rates such tactics as short-sighted whiling giving sane, alternative routes to be productive, stress-free, and at peace with yourself. Curiously, Low Man on the Totem Pole tells us that promotion at work isn't everything. The author testifies to have seen people fall out of love with their work after being promoted at they started doing work that does not play to their strengths. Also, workers can be promoted to a position that has no future relevance to the company, hence such can be the first to be laid off after company setback. Like most self-help books, the book sometimes falls into clichéd motivational rants. Thankfully, those moments are rare. "Of course, there are no guarantees or easy-to-follow instructions. But what I can say for sure is if you don’t value your capabilities and unique talents, no one else will either. Many of you have spent so little time contemplating your purpose that you are completely disconnected from it. At the same time, you might be bitter that no one pays you more money for what you do…even though you may not value what you do either. "To know your value is a lifelong journey of discovery. But the first step is to remove judgement and shame. Some of us have unique talents that were embraced by the social circles we were born into, while others have been shamed, ridiculed, or belittled for our unique talents. We are leaving an age of few career options and entering one with room to be anything you want to be. We aren’t fully in this new world yet, even with the bursts of creativity we see all around us (self-driving cars, anyone?). But we are getting there." 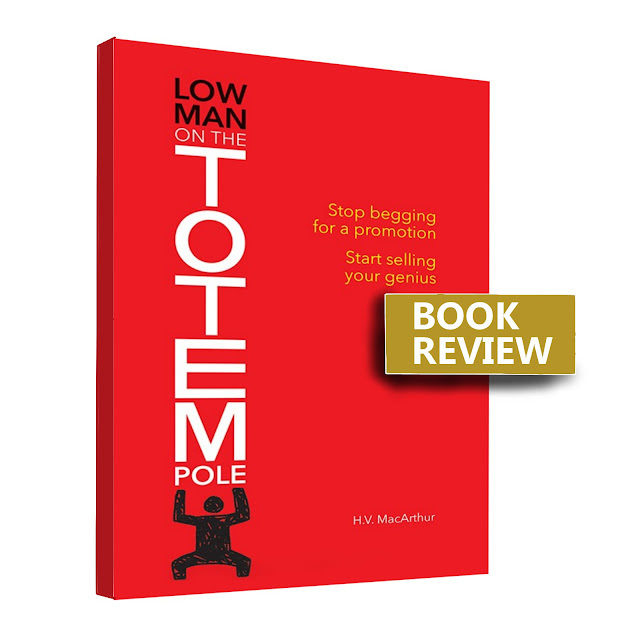 Low Man On The Totem Pole: A Tough-Love Letter to the Employee in All of Us by H.V. MacArthur hits stores in January 2018, available in all major online bookstores. Many thanks to Salem Author Services for review copy.